The idea for è Ispirante began when I was hired to make a corset for a woman who had polio as a child and must wear a corset every day. When I saw the corset she wanted me to copy, my first reaction was how unattractive it was. I thought that if this is something that she has to wear every day, why not make it look nice as well as functional. After perfecting the fit, I then added lace, that was securely stitched down to avoid catching on anything, and trimmed the edges and covered the boning tape with a floral print. The Client was very happy with it and we proceeded to make a second one in various batik fabrics. You can see these corsets on my website by clicking on "About" and choose "Corsets" in the drop-down. I then looked at available Adaptive Clothing and wanted to give people more exciting and fashionable options. 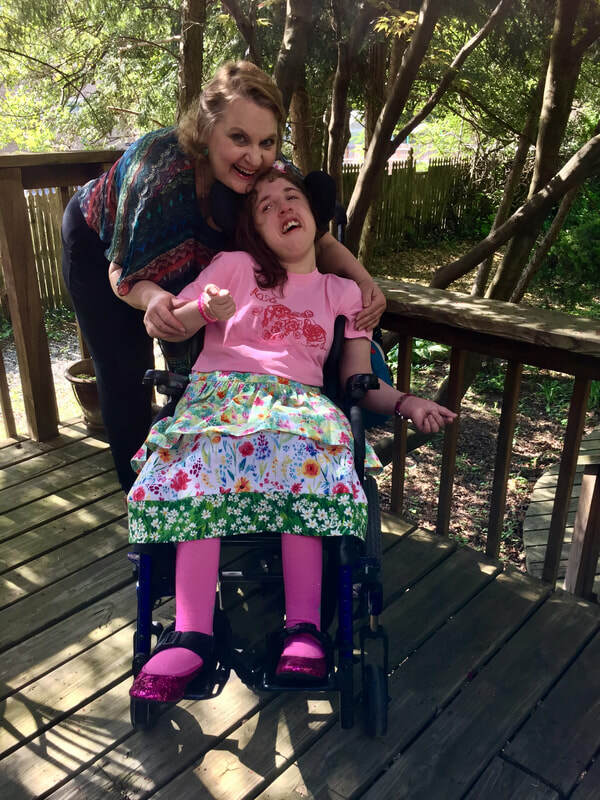 At the same time, I began making skirts for my friend's daughter who has Cerebral Palsy. Both her and her daughter loved the skirts as they were easy to take on an off using my design features, and were made with fun fabrics as well as sparkly fabrics! 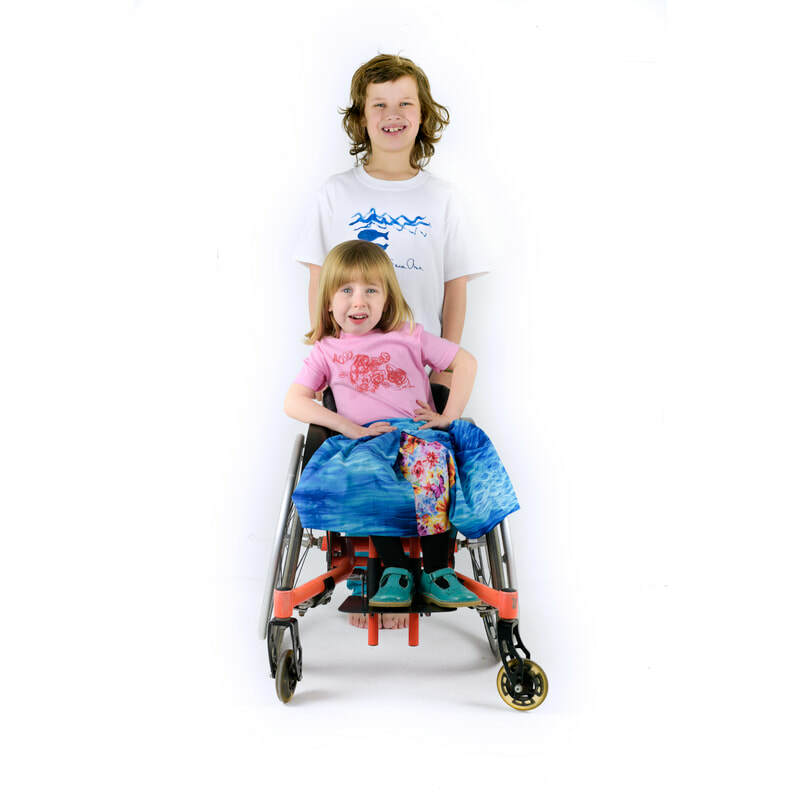 I then decided to start creating fun and attractive Adaptive Clothing for girls. è Ispirante was born! Plans are to expand the clothing line to include additional clothing items as well as Adaptive Clothing for Women, Men, and Boys. 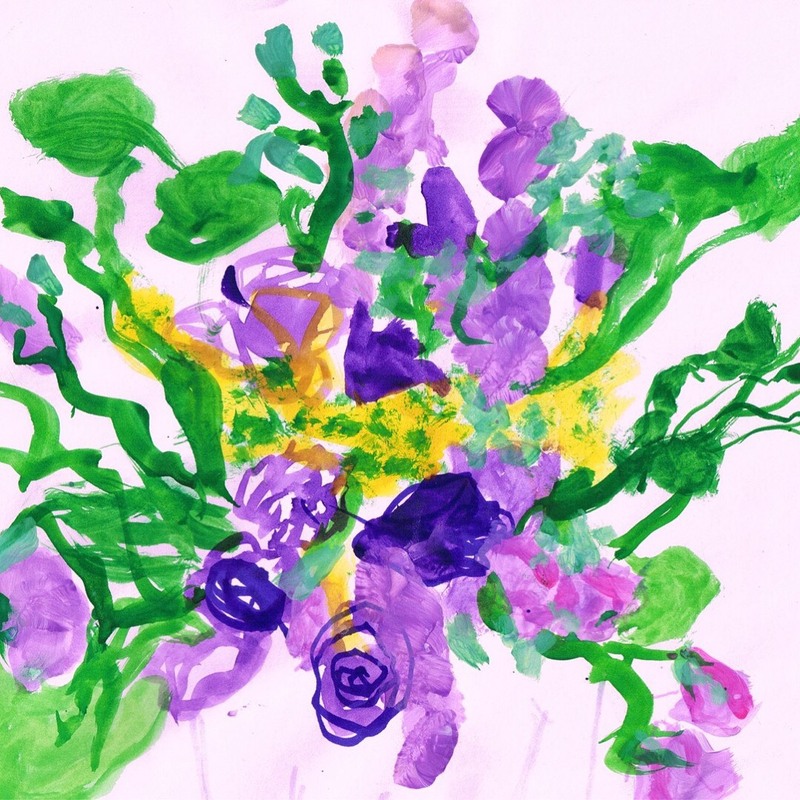 My friend's daughter is Sara Ann, who is an amazing painter! I have chosen some of her paintings and had them printed on T-shirts to sell along with the skirts. Sara Ann will receive a percentage of the profits from the sale of the T-shirts. 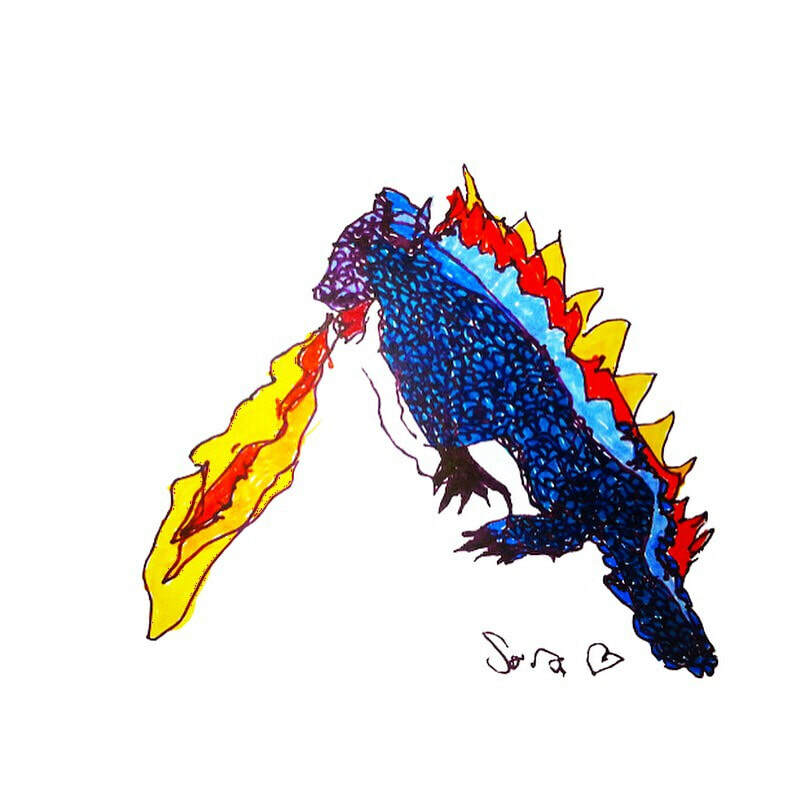 Going forward, the T-shirts will be Adaptive designs and feature many other paintings done by Sara Ann. 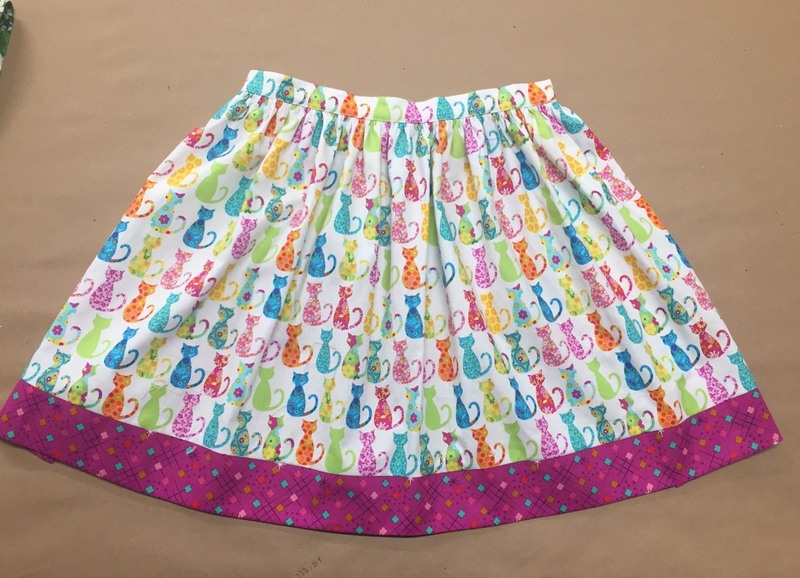 The Skirts go 3/4 of the way around the waist similar to an apron. The waistband goes all the way around the body and closes with velcro. The current T's are not Adaptive, but going forward will have an Adaptive design as mentioned above. The Skirts and T's are 100% Coton. 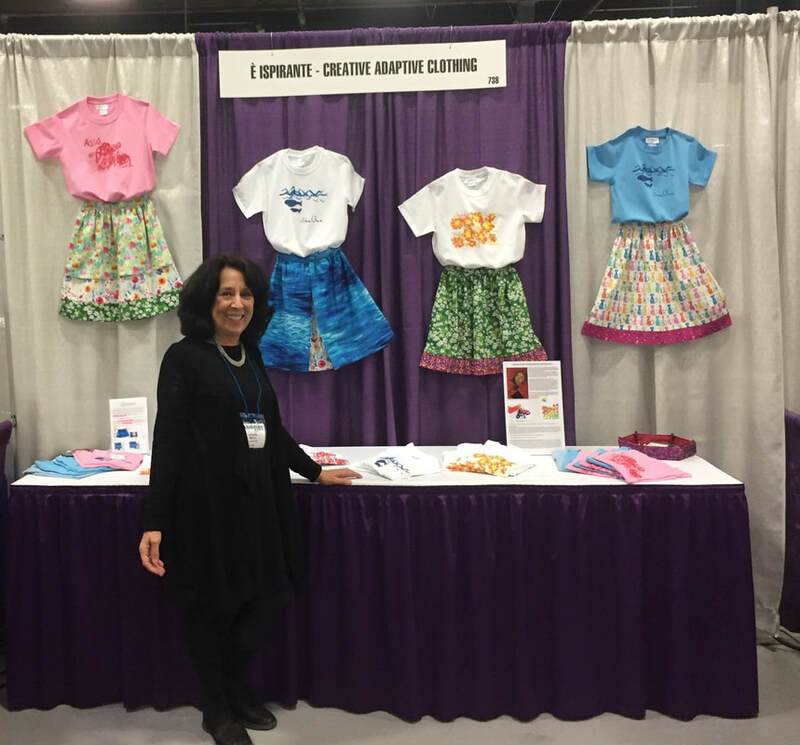 My first showing of the skirt line was at the Abilities Expo in LA, February 23, 24, & 25 at the LA Convention Center. It was a great show and I met many amazing people and made wonderful contacts! Following that, I had a booth at the NY Metro Abilities Expo in Edison, NJ. Sales at this Expo increased signigicantly over the LA Expo! It is nice to see the business building! All Skirts and T-shirts have been added to the STORE here on this website and are ready to order! After this initial set-up, my website will be re-done and re-branded to make your viewing and ordering pleasure much easier and more exciting! You may email me with any questions at; eispirante7bb@gmail.com. PLEASE STAY TUNED! I am currently working on a line of Skirts for Women! SEE THE "TOILE" AND FIRST DENIM SAMPLE FOR THE FIRST WOMAN'S SKIRT BELOW! I ALSO HAVE AN ADULT VERSION OF THE CHILDERN'S SKIRTS WITH A FULL BACK. Below is a photo of Eudora in the Guily Skirt - Combo 2 worn with the "Roses T-shirt and her brother Ivor in a "Whales " T-shirt. Sara wearing the "Sara" Skirt, Combo 1, ​ paired with a "Roses" T-Shirt. Sara is sporting the "Sara Skirt"
​Combo 1, matched beautifully with the "Sunflowers" T-shirt. ​Combo 1, paired with a "Whales" T-Shirt. ​Combo 2, with the "Whales" T-shirt. ​with her sunglasses on in her "Melissa" Skirt, Combo 2, worn with the "Roses" T-Shirt. A happy girl in her new Skirt! ​ Her parents, especially the mom, were so excited, they purchased 2 Skirts! "GIULY" SKIRT (COMBO 2 ) WORN WITH PINK "WHALES T-SHIRT"
MORE HAPPY GIRLS IN THEIR NEW SKIRTS PURCHASED AT THE NY METRO ABILITIES EXPO! Below are Skirts that I have made for Sara Ann. These are One-of-a- Kind. This is the first skirt that I made for Sara. She loves Angels. This first design had a waistband that ties. I have since redesigned the waistband to close with velcro. Here is a favorite Skirt of Sara's. I lined the back with a sparkly net, meaning it to be the lining, but when Sara saw it, she liked to wear the lining side also! Since the lining was cleanly finished, it allowed her to do that! 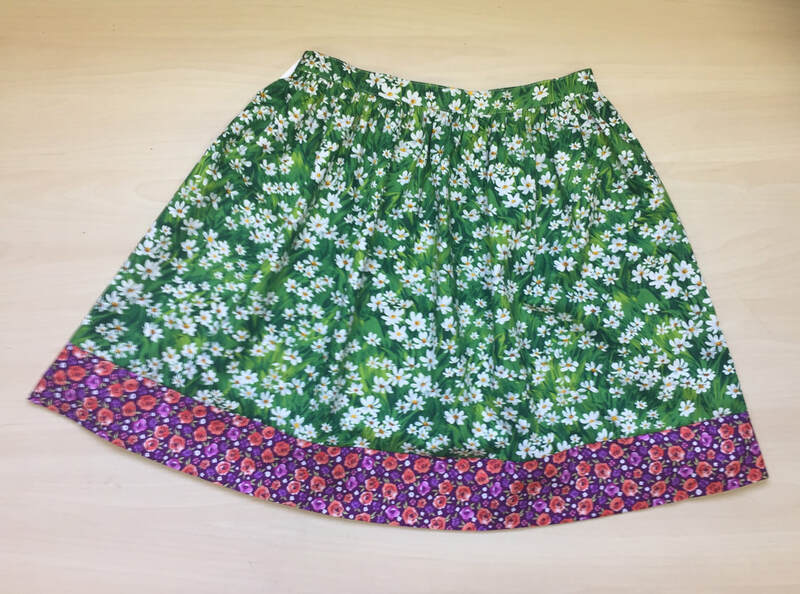 So, this is now a reversible skirt! Sara, loves Sparkles , so I made her a long Sequin Skirt. Her mom found a great sweater to wear with it! Here is a "Toile" for the first Woman's Skirt in my Adaptive Line. This Skirt has many features that make it comfortable for wearing while seated in a wheelchair. I will be using nice fabrics to make the final Skirt for production. Below is the first sample in Denim. This skirt will also be produced in a summer weight brown herringbone wool . Perfect for the office! This skirt features a zippered pocket on both sides of the skirt front, hidden below the front tuck, that are lined in print fabric. The side closes with a zipper and has an elasticized back waist for comfort. 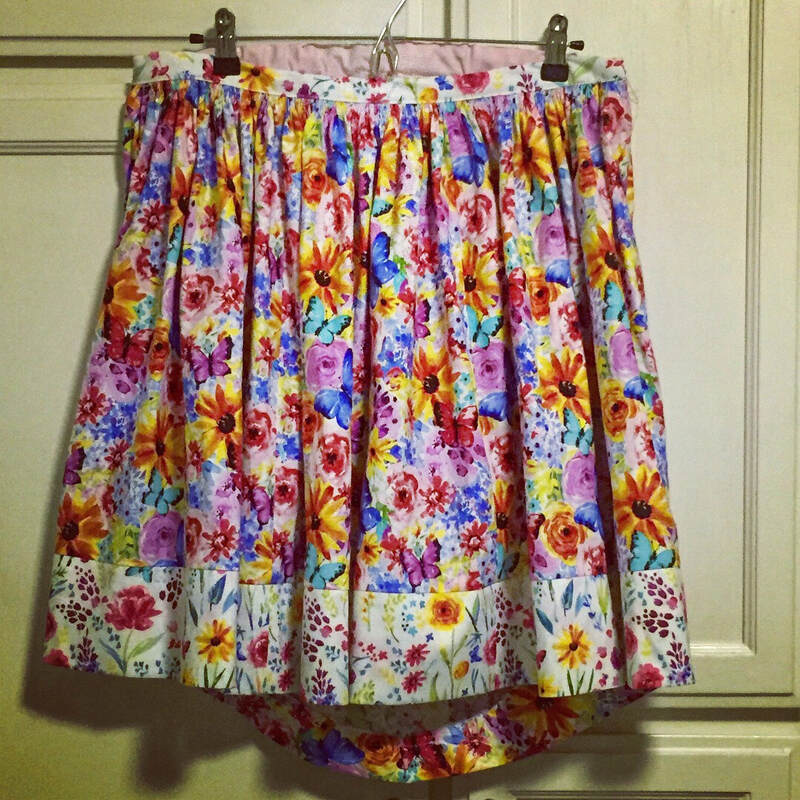 The floral skirt for Adults with a full back is featured below. The skirt has side inseam pockets, a flared front, and a smooth fitted back. The back for this one and the denim sample above, is shaped to the body as it is seated. The back waist is cut higher as well as the back hem cut longer, so when seated, the back waist and hem are level. Notice the extra fabric in the back that will accommodate being seated. Here is another variation of the Skirt above. For this one, I have added more fullness in the front, still keeping the side pockets, higher back waist, and lower back hemline and elasticized back waist.